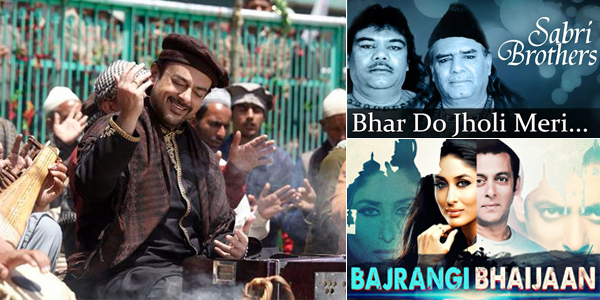 Raaga.com: Is Salman Khan’s Bhar do jholi meri….song from BAJRANGI BHAIJAAN a rip-off of Pakistan’s famous Sabri Brothers’s qawwali? Is Salman Khan’s Bhar do jholi meri….song from BAJRANGI BHAIJAAN a rip-off of Pakistan’s famous Sabri Brothers’s qawwali? It seems the super duper hit spiritual qawwali Bhar Do Joli Meri Ya Muhammad….sung by the legendary Sabri Brothers of Pakistan is perhaps being repackaged into a contemporary qawwali in Salman Khan’s latest upcoming movie BAJRANGI BHAIJAAN. Sung by eminent Pakistani music composer-singer Adnan Sami, who is best remembered for rendering hit songs like Kabhi to nazar milao…, Tera chehra …. and Lift kara de…, the song is composed by Pritam Chakraborty. Though speculations are rife that Bhar do jholi meri…. is inspired from the Sabri Brothers legendary hit qawwali yet the film director Kabir Khan neither Salman Khan have disclosed much about the song. Interestingly few may know that earlier the original qawwali Bhar Do Johli Meri Ya Muhammad… has been used in the 1975 little known film BIN BADAL BARSAAT. In fact several hit qawwalis of Sabri brothers have featured in Bollywood films like Tajdar-e-Haram Ho Nigaah-e-Karam….SAHAARAY (1982) and Aftab-E-Risalat Madine Mein… SULTAN-E-HIND (1977). Adnan Sami is making a tie-up with Salman Khan after a long time. Earlier the duo has worked together and created magic in films such as SALAAM-E-ISHQ, JAAN-E-MANN and LUCKY - NO TIME FOR LOVE.